Russian writer and poet; born 1860 in the Jewish agricultural colony of Bobrovy-Kut, government of Kherson. In 1880 there appeared in the "Razsvyet" his first poem, which attracted the attention of the reading public. In 1881 he removed to St. Petersburg, and published poems in the "Voskhod," "Russki Yevrei," "Yevreiskoe Obozryenie," and other periodicals. He used the pseudonyms "Ben-Zvi," "Bobrovokutski," "S. F.," "G. S.," "Sluchainy Felyetonist," "F.," "S.," and very rarely wrote under his full name. His first volume of poetry, "Stikhotvoleniya," appeared in 1885; the second, entitled "Dumy i Poesii," in 1887; second and third editions of the first volume in 1890 and 1897 respectively. Most of Frug's critics attribute to his work a high lyric quality. Leon Gordon dedicated to Frug a poem in which he calls himself a "dead leaf" and Frug a "living leaf" ("Ha-Asif," 1884). In 1886 Frug's Yiddish poems, which had been published singly in Spektor's Hausfreund," Rabbinovitch's "Volks-Bibliothek," the "Volks-Blatt," and other periodicals, were collected and published under the title "Lieder und Gedanken." In 1898 there were printed in St. Petersburg sketches of people he had met, entitled "Vstrechi i Vpechatleniya" and "Eskizy i Skazki." Somewhat later his fable "Palma" appeared. In 1897 a three-volume collection of his poems was published in St. Petersburg (Hebrew translation by Jacob Kaplan, Warsaw, 1898). In 1902 his "Zionidy," Zionistic songs, were printed in St. Petersburg. Frug is one of the most sympathetic of the Russo-Jewish poets. He is essentially a lyricist. His epic poems are not marked by distinct originality. 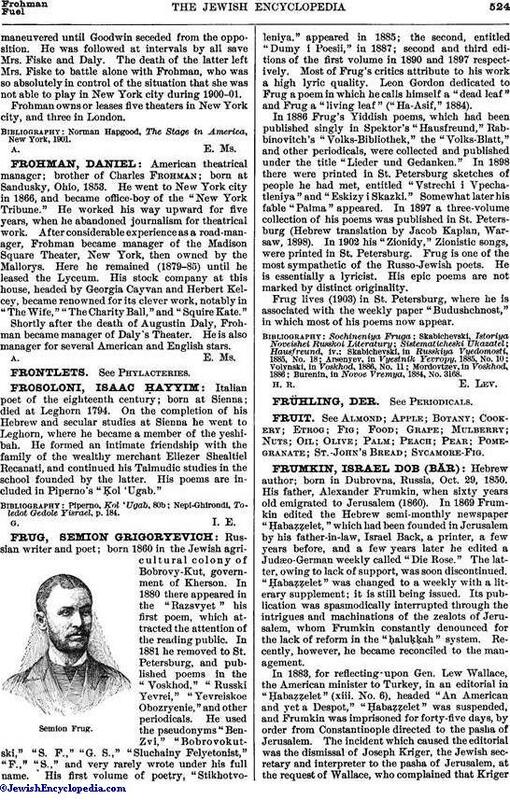 Frug lives (1903) in St. Petersburg, where he is associated with the weekly paper "Budushchnost," in which most of his poems now appear. Burenin, in Novoe Vremya, 1884, No. 3168.